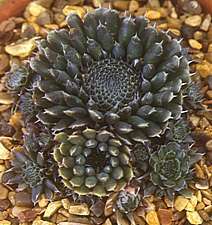 The Crassulaceae is a large family of 1500 species in which most genera exhibit a degree of leaf succulence. Some succulent Crassulaceae are frost-hardy and suitable for use as garden plants and in horticultural displays. A common feature of the Crassulaceae is the biochemical adaptation to arid conditions: Crassulacean Acid Metabolism (CAM). Because organic acids are used for temporary sequestration of carbon dioxide, CAM plants often taste bitter. Adromischus are desirable leaf succulents which can be grown on a sunny window ledge. Their varied colour, leaf markings and form makes them highly collectable. Cotyledon includes interesting shrubby species with succulent stems and leaves. Some species have showy tubular yellow, orange or red flowers. The genus Crassula includes the well-known Jade or Money Plants and other small succulent sub-shrubs, choice miniatures and mat-forming plants some of which are frost-hardy. The succulent rosettes of Dudleyas and Echeverias are insufficiently hardy to survive a cold, wet winter, but they are often used as summer bedding plants and housed under glass for the winter. Kalanchoe includes succulent plants with showy flowers, that are propagated in vast numbers. 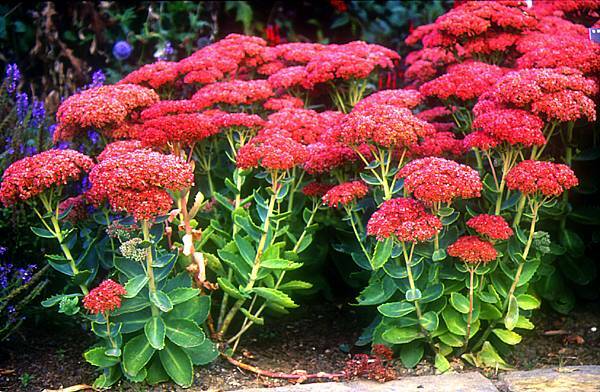 Sedums are well known for hardy mat-forming succulent Stonecrops and for larger hardy succulent species such as Hylotelephium (Sedum) telephium which provides useful flower colour in the garden in late summer and early autumn. 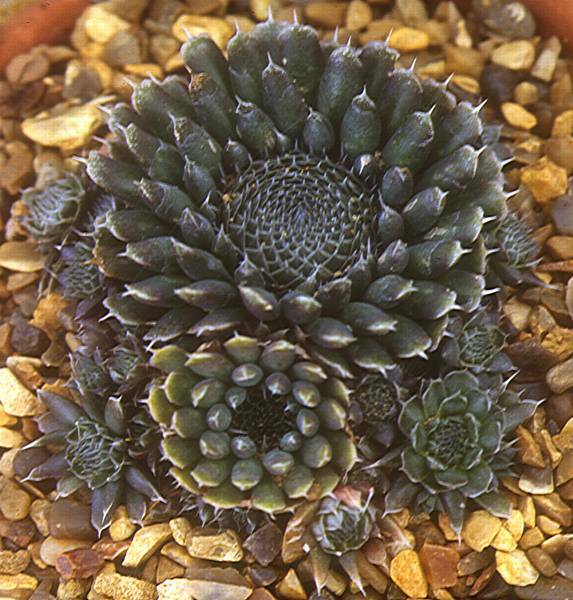 Sempervivum, Jovibarba and Rosularia form clumps of succulent rosettes, with hardy cultivars in many colours and forms. Sempervivums add an exotic touch to any garden. Tylecodon is a South African genus of small shrubby succulent plants with swollen stems that grow and produce leaves during the winter, flowering in the spring or summer. Umbilicus or Pennyworts are small plants with characteristic succulent leaves that have a navel-like depression over the site of stem attachment on the underside. Some Crassulaceae are poisonous, especially in the genera Cotyledon, Kalanchoe and Tylecodon whose members contain cardiotoxic and cumulatively neurotoxic Cotyledoside, and should not be consumed or fed to animals. These plants are unpopular with South African farmers as they cause a wasting disease Krimpsiekte or death of livestock.